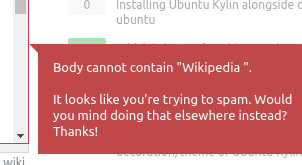 Out of all the words that there are for spam, the system latched onto "According" and "Wikipedia". IMHO it is overboard and puts sticks into wheels of users who are trying to write well-researched answers with sources. Please revise the spam filter, as this is . . . how should I put it . . .doesn't do what it's supposed to do. On a side note, I propose a rep-cap feature added to spam filter. Users like myself - with over 10k of reputation - can be sufficiently trusted. CJK characters were blocked on Ask Ubuntu in response to a wave of spam. 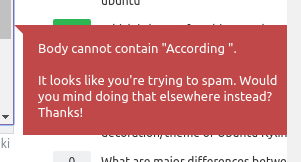 The message is intentionally misleading, to discourage the spammers from just working around it. I've removed the block for now... If the site is deluged with spam, it may be re-added. According to Wikipedia, the llama is a quadruped. Edit: That posted fine. I wonder if this was a temporary bug that is now fixed. Not the answer you're looking for? Browse other questions tagged bug status-completed spam .